← Single sit reads… the solution for the busy bibliophile. Since my experience with Snicket’s tale, I cannot recall the last time someone read me a story. It seems that as we move into high school and beyond, the focus of shared reading shifts into preaching for independent readers. While the very essence of my blog name screams independence and literature, I cannot help but miss the art of listening to a story. For the past eighteen months I have endeavored to reintroduce ‘listening’ to books into my life through the form of audio books. I am so happy to see that it is growing in popularity with readers of all ages. It is such a different experience than reading a book and I admit dear reader, I have had to train myself to be able to stop and listen to the story. In my pursuit to live a more mindful life through this blog, listening to audio books has enabled me to practice ‘switching off’ and focusing my thoughts on the story at hand. For me, relaxing my mind after work is the most difficult skill to master. In silence, I always face lots of wandering thoughts about the dinner I would be cooking that night or the dreaded lesson plan I had not organised yet. The reason I have fallen in love with audio books as I am a reader who always complains that I don’t have time to be reading. Audio books are able to accompany me when I walk down around the block or when I’m doing my food shopping. I listen to them when I’m getting ready and driving to work. They allow me to get stuff done while getting reading goals accomplished at the same time! My audio book of choice has been the ‘A Song of Ice and Fire’ series written by George R.R. Martin. I was lucky enough for my friend to give me MP3 copies of it to upload onto my computer and iPad. I have been so invested in the HBO T.V series since it came out and have always wished that I had read the series before I watched it. I have always been put off reading this series because they remind me of encyclopedias… But the covers are so gorgeous! Now dear reader, I must advise that when selecting an audio book to read, I believe that is the most important factor is that you need to appreciate the voice. If you don’t like the narrator’s voice, your attention will not be held. When listening to the series, I find the characters I fell in love with in the show come to life through the narration of Roy Dotrice. 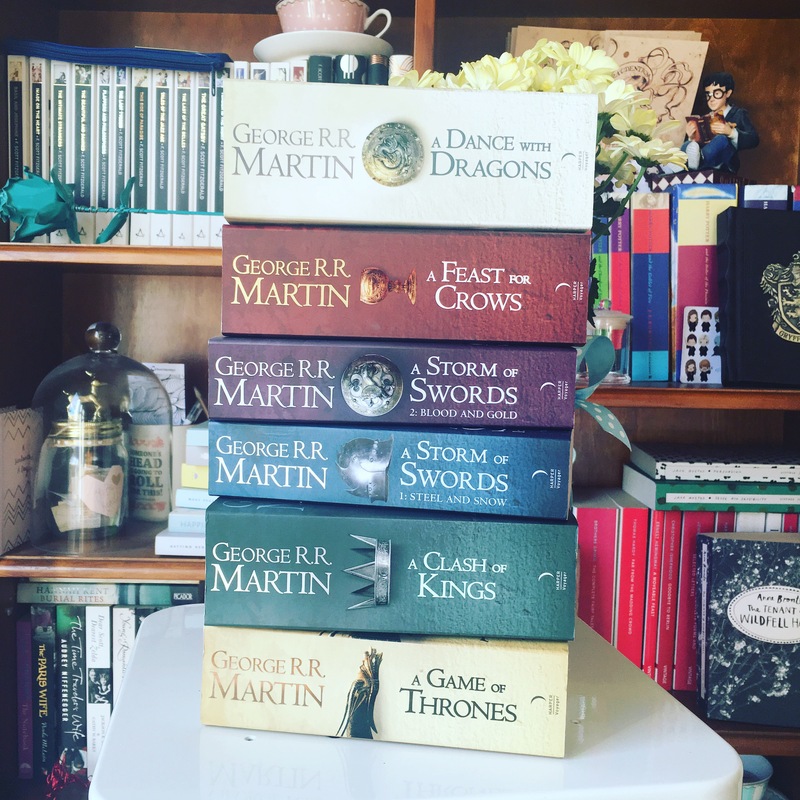 If you choose to listen to a series as long as ‘A Song of Ice and Fire,’ you need to be in love with his voice as it is a huge commitment. Roy Dotrice is a famous voice actor who was extremely close with George R.R.Martin who was personally asked to record the series. He even has a sneaky guest appearance in Season Two of the show where he plays an Alchemist in Kings Landing. He speaks slow and clear which is good for delivering the ancient languages with Westeros. And I find that he is able to differentiate between the characters with ease and I am always aware when a new person is talking. My favourite accent he does is Jamie and Tyrion Lannister, as he captures the wicked sense of humour of the Golden Lions perfectly. Reading the first book ‘A Game of Thrones’ was such an enjoyable experience. The first season of the TV series is almost word for word. My favourite character ‘point of view’ was Ned Stark, and I absolutely loved getting inside his head. I tried going on to ‘A Clash of Kings,’ as a novel version, but I couldn’t get past the prologue with Stannis Baratheon. Sadly, the series made its way back to my never ending of shelves of books waiting to be read. However, when I was listening to the audio nook I ended up devouring the story in just over a month! The audio book was a match made in reading heaven for me. For a period of time, I felt that I had to stop listening to my audio book. I got 30 chapters in to the story and I realised I wasn’t recalling a lot of what I read. My personal thoughts kept creeping into my head and I had to stop to focus on my work. The content of the series is extremely heavy an I just needed some time to focus on reading my paperbacks. Also, the violence was, at times, too much so early in the morning. 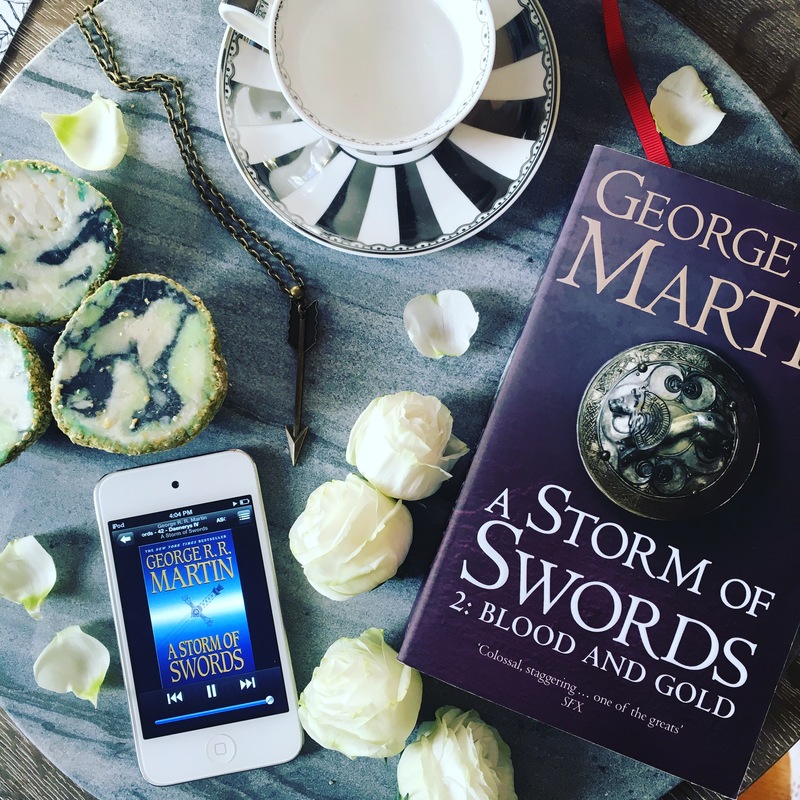 However after watching Season Six of ‘Game of Thrones’ in less than 24 hours of the school holidays, my love for the series has reignited and I have been back listening to the audio version everyday. I can now comfortably appreciate the violence and destruction of the story after a hiatus. The first thing I always pack before I go on holidays are my books… So it’s even more handy always having my audio books with me! I also keep a bookmark in my physical copy of the novel to help me keep track of how much I listen to each day. I usually get through two chapters a day, but if I have more free time in my day it will always be more. Currently, I am up to the second half of the third novel ‘A Storm of Swords: Blood and Gold’ and I am 50 chapters into the story.I am hoping that I finish the series in time for the very anticipated release of Martin’s sixth book in the series’The Winds of Winter’ (And hopefully number seven ‘A Dream of Spring!’) However, at the rate he is writing, I think I have plenty of time and will gladly wait for him to perfect his masterpiece. If you get the chance dear reader, find yourself an audio book with an interesting storyline and an engaging Narrator. Make yourself a morning coffee and spend time listening to it. It might take you a while to let go of niggling thoughts, but I guarantee that you will fall in love (once more) with listening to stories.